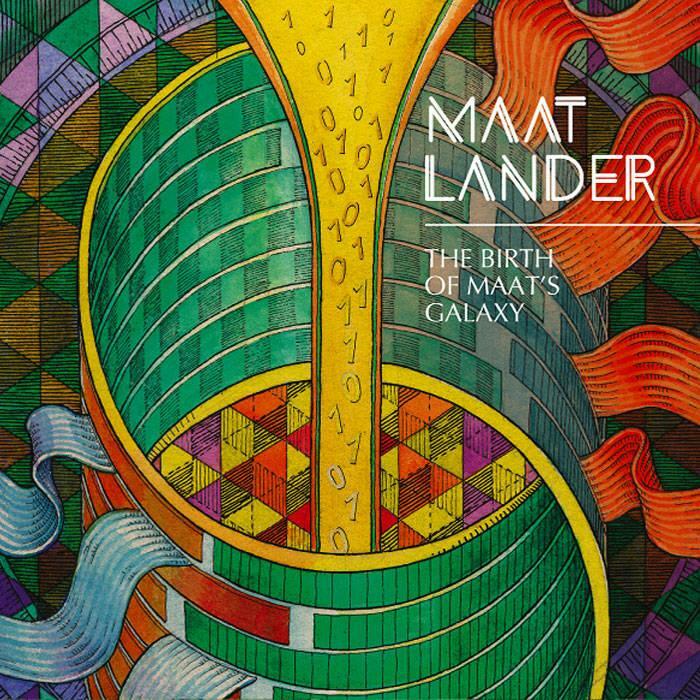 Maat Lander is a new instrumental Space Rock trio that brings together members of two of my favorite R.A.I.G. label bands: Ilya Lipkin of The Re-Stoned (guitar, mandola), and brothers Arkadiy (keys, synths, bass) and Ivan (drums, percussion) Fedotov of Vespero. This 10 track set is a winner from start to finish, with tracks in the 4-9 minute range. The Comet Rider opens, featuring totally cosmic, tightly wound Space Rock performed with a high level of musicianship like a combination of Vespero, Ozric Tentacles, Hidria Spacefolk, Oresund Space Collective and Korai Orom. Alnilam is an alien ethno-trance blend of mandola, ethnic percussion, soundscapes and oodles of sci-fi effects. Maat Lander inject a pounding rave worthy rhythmic pulse into Spiral Arms, which rocks hard and includes killer ripping and screaming guitar. To Johannes Kepler and Gliese 581 are both beautifully atmospheric and cosmically haunting excursions that you can float and groove along with. Two Keys To The Sky is similar and includes some Bluesy Dave Gilmour-ish guitar. Aquarius is a high energy and sometimes whimsical blend of Space-Prog, Jazz Fusion, the Ozrics at their most rocking, and spaced out atmospherics. Lunar Rocket blasts off the launching pad for some powerhouse Space-Prog with seductively melodic but also dirty rocking guitar solos and a frantically swirling stew of space electronics. Coma Berenices starts off with a combination of sequenced synths, falling star electronic effects, steadily potent drumming, Prog guitar soloing and soundscape guitar, but then bursts into the stratosphere as an in-yer-face, heavy duty Space Rock blast, while always retaining an overall atmospheric feel. Finally, the title track is an electronic heavy track that’s a steadily grooving and melodic jaunt through the cosmos. It’s got some cool Bluesy jamming guitar and classic Prog keys too. I’ve long known from the Vespero albums what excellent musicians the Fedotov brothers are, but Ilya Lipkin REALLY shines on guitar. We don’t get to hear him play like this on The Re-Stoned albums. Really smokin’ guitar solos. BUT the guitar also contributes to soundscape creation, making for a hot atmospheric combination of guitar and keys/synths. Fans of instrumental Space Rock and rhythmic atmospheric explorations played by smokin’ hot, creative musicians should drop whatever they are doing and get this NOW. Highest recommendation!